We’re looking east on West Georgia Street: the Archives at this point have an undated image (and unidentified location). The cars, and the changes in the buildings suggest some time in the 1970s. 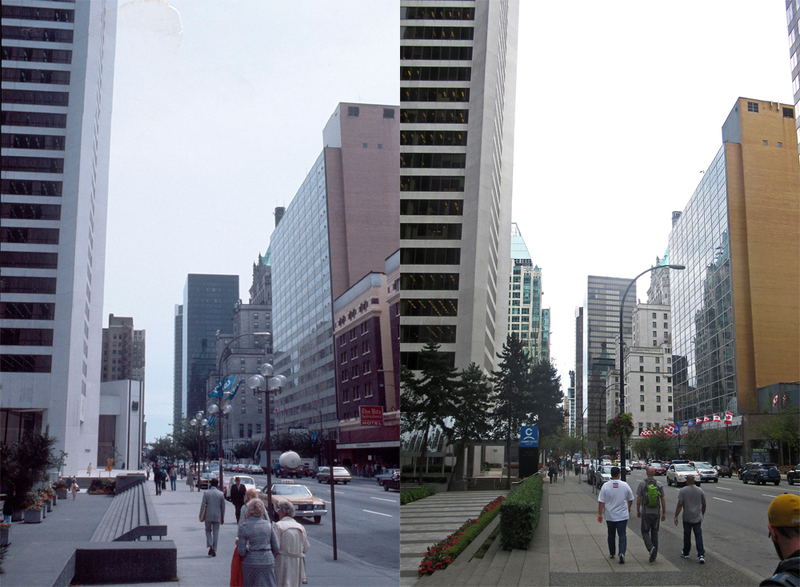 The Royal Centre is complete, so we’re past 1973, Cathedral place hasn’t replace the Medical-Dental Building, so we’re before 1992, and the Burrard Building has it’s original skin, so it’s before 1988. The Ritz Hotel is still standing on the right of the picture, so it’s probably before 1980. By 1985 the Grosvenor Building was completed here. In the distance, behind the TD Tower is the Vancouver Centre – completed in 1976, so that puts us squarely into the mid 1970s. 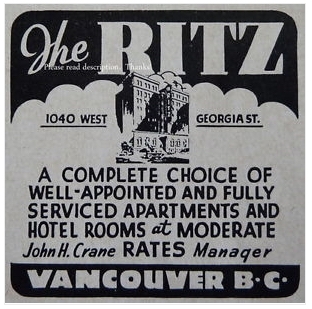 The Ritz International may have had the prestigious name, but it wasn’t as classy as the Hotel Georgia or the Hotel Vancouver down the street. The hotel was a conversion of the St Julien Apartments, and that was itself a conversion of the new YMCA which received its building permit in 1913. The permit shows that it was designed by H S Griffith as a 7-storey, reinforced concrete structure, to be constructed at a cost of an extremely ambitious cost of $375,000. The 1912 insurance map shows the Y began building that year. 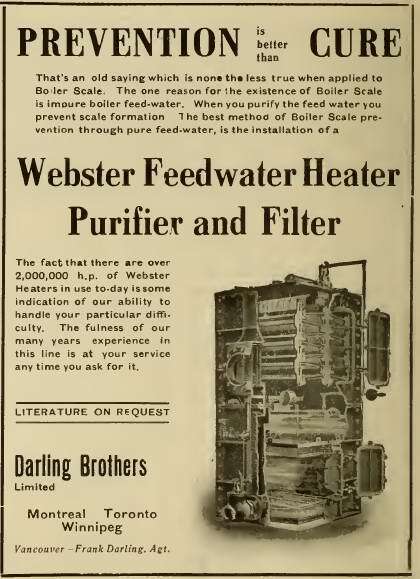 The start of World War One, and an economic depression meant that by 1919 the structure was still not complete and it was decided that it should be sold. In 1924 the building was completed as the St. Julien Apartments (seen here around 1925) but those didn’t last very long, and in 1929 was turned into the Ritz Hotel. Not all the apartments were turned into hotel rooms – the property offered both hotel rooms and ‘fully serviced apartments’. The Ritz stayed as a hotel – it didn’t become a low-income rental property as many further east, and was finally demolished in 1983 to be replaced by the Grosvenor Building, a multi-faceted gold coloured tower that allowed tenants to offer the prestigious ‘corner office’ to more of its employees. 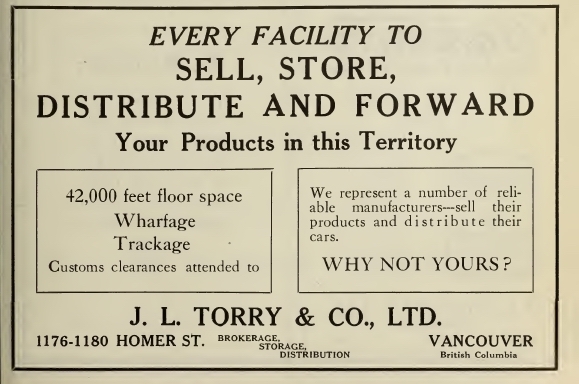 Today it’s a condo building called Exchange, but when it was built in 1913 it was the B. C. Telephone Co., Ltd’s new warehouse and office – and not, as some sources (and the name) would suggest, a telephone exchange. It cost $35,000 to build, and the company claimed to be both architect and builder of the four storey ‘brick and stick’ structure built in the same style as warehouses found in Yaletown. It’s possible the design was completed in-house; it’s equally possible that an architect was hired but the company then submitted the plans themselves. If so it’s quite likely to have been Thomas Hooper, who designed other buildings for the company around this period, and who had plenty of experience designing straightforward industrial boxes. In 1913 1st Avenue was called Front street, and the permit here was for 366 to 376 Front Street. Once it was operating the building often had a Wylie Street address, although initially this was addressed as Yukon Street. 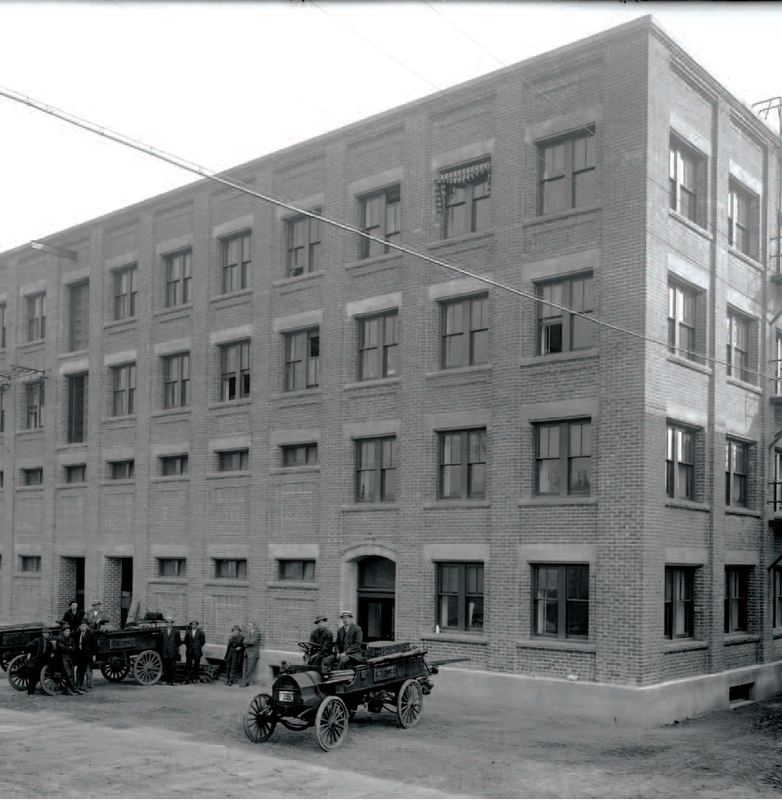 It was essentially a warehouse for spools of cables and wires, telephone and related equipment, and the Archives have a 1915 image that shows BC Telephone vehicles and crew ready to service their customers, parked in front of the Wylie Street façade. There’s another 1922 image showing a row of service vans lined up. Around 1927 an addition was built to the east of the 1913 building, in a different style without the large lintels of the earlier building. There was also a low, single storey wing extending further to the east. At a later date some of the small Wylie Street windows were replaced to match the larger windows. In 1982 Best Facilities Services moved into the building and operated from here for over 20 years. Our 2003 image shows the building when they were still located here. They offered a range of property management and related services. 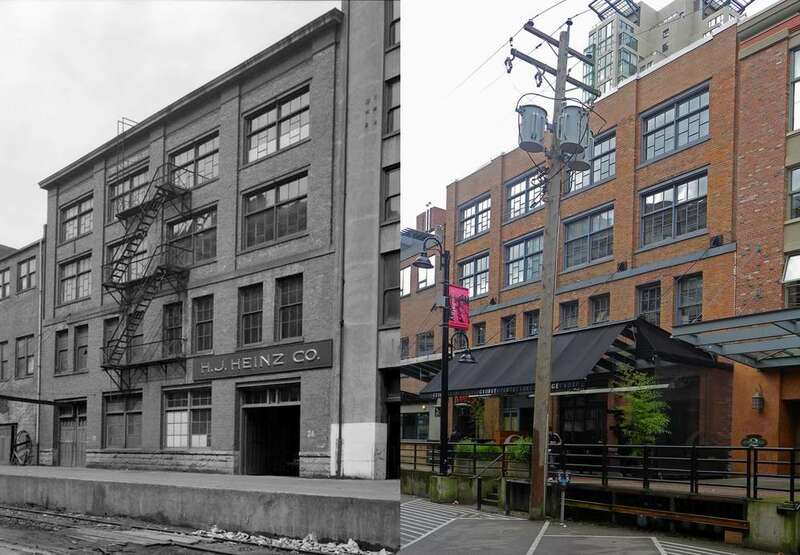 As the Southeast False Creek development evolved, the buildings were sold for development, but the developers, PCL, chose to carry out a heritage conversion rather than demolish and replace the warehouse. They were given a Heritage Bank allowance worth over $2 million to retain and repurpose the building. A new six storey block was built to the east, with the whole project designed by Burrowes Huggins Architects. the elevator core that serves both halves of the project helps provide seismic stability to the older buildings. Today the building is surrounded by other SEFC housing projects, with the final part of the block across the lane to the south expected to be built very soon. To the west the Maynards Block has been developed, and further development can be anticipated across the street to the north in the near future. Our 2003 ‘before’ image was taken shortly before the demolition of the Plaza Hotel. Despite the swanky name, the Plaza was a run-down SRO hotel with 33 rooms on part of a small development lot (only 12,000 sq ft) that was, at the time, potentially developable as a condo tower. A numbered company applied for the project which had 120,000 of space above ground, and 60,000 below grade as a 6-storey parkade. The tight site meant that a lot of the underground space was taken up by parkade infrastructure of elevators and ramps. A 3-storey podium was proposed with 16 floors of condos designed by Hancock Bruckner Eng & Wright, and a public benefit of space for the Artstart for Kids program, still running today. Back in 2003 Council took a less stringent approach to the loss of older SROs, and with payments to the replacement housing fund of $5,000 a room and an additional contribution to the affordable housing fund Council of the day approved the loss of the rental space. The building, christened ‘R&R’ (Robson and Richards) was completed in 2006. The predecessor ‘hotel’ here started life as the Montgomery Block. Approved to be built in 1911 for J A Montgomery, it was designed by G P Bowie, and described as a “4 storey brick store & rooming house; marble entrance, hot water heating, plate glass front” costing $29,000 to build. Egdell & Dixon were the contractors, although Mr. Bowie supervised the work (which wasn’t always the case in those days). Mr. Bowie designed several larger residential buildings during the city’s early 1900s boom, as well as Yaletown warehouse projects. He was also responsible for the design of the lumbermen’s Arch in Stanley Park. He died in July 1915, fighting in Ypres. The building was delayed a little – but in March 1912 the Daily World announced that Mr J A Montgomery of New Westminster would commence construction of his 4-storey building, which would cost $33,000 and was expected to be completed in June. In 1913 it was called the Richelieu Rooms, run by Mrs J E Conroy. The names of the proprietor changed frequently; every year we checked to see who was running the rooms found a new name – in 1919 J A Trepanier was running the establishment, in 1925 O and H Agnew and in 1930 Mrs L H Smith. In 1940 Mrs A Chambers was shown as running the rooms, and in 1950 L T Taylor was running the now renamed Plaza Hotel. John Alexander Montgomery was born in Drummondville, Quebec and was married to Fannie, also from Quebec. She had been married to Rev. Simeon Huff and had two children, but he died in 1900, and she remarried in 1906, having two more daughters, Jean and Joyce. John Alexander Montgomery, who had lived in New Westminster from 1887, was described as “one of the best known and most highly respected men of the city, each year having chronicled an increase in his prosperity and his additional security in the esteem and confidence of his fellow citizens. He was born in Drummond county, Quebec, and is a son of James and Jane (Bothwell) Montgomery, pioneers in that province, where the father engaged in farming. There’s a three storey building in our 2011 ‘before’ image that dated back to 1912. Designed by William O’Dell for Albert Milton when 2nd Avenue was called Dufferin Street, this was described as a factory/warehouse three storey brick stable. Assuming that the Albert Milton who built this is the same Albert Milton in the 1911 Census (which is a pretty safe bet as he was the only Albert Milton listed), he was from Ontario, already retired at the age of 50 and living with his 38 year old wife Luretta and their four children, Ada, Ernest, Aletha and Edward. Ada was aged 18, and all the children were born in BC, so the family had been in the province for a while. William O’Dell in Vancouver wasn’t really an architect; he was a builder. He constructed an East Cordova hotel, but the owner hired an architect to design it. He also built one of the buildings in an earlier post. In the 1880s however he was one of four architects in Nanaimo, so had the ability to design this structure with no difficulty. It was indeed a stables, run by Burke & Wood Co Ltd, a transportation company. In 1913, when they were first shown having their stables located here, their transfer office was on Water Street and H Vasey was company president. There was another Water Street firm of draymen, Burke and Cameron, and we assume it might be the same Mr. Burke; Allan (or Allen) L Burke. In 1913 Mr. Wood was no longer associated with the company, but he was S P Wood, and in 1910, like Mr. Burke, he lived at 791 Cambie Street. 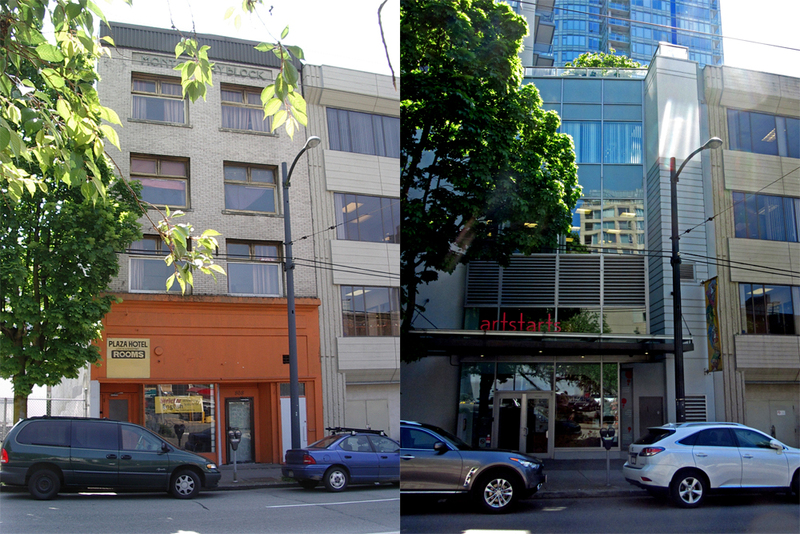 The company had a stables then at 102 Harris Street – today’s East Georgia Street. It’s surprising how long horse-drawn transportation remained viable in the city: the company operated here all the way to 1920 – then the building was shown as vacant. In 1923 the street name switched to East 2nd Avenue, and Burke & Wood Co Ltd are shown here again all the way to 1930. In the early 1930s it became home to Vancouver Art Metalworks Ltd, run by J Woodman. From the early 1940s until at least 1955 Hume and Rumble, electrical contractors, were based here. The South East False Creek area was identified to be ‘let go’ from industrial to residential uses in the late 1990s, but development only took off a few years ago. The residential over retail building here, called Proximity, was designed by IBI/HB for Bastion (who also developed Opsal nearby), and was completed earlier this year.